Glenn Curtiss was an aviation pioneer who went on to form his own aircraft company. He was born in Hammondsport, New York, on May 21, 1878. As a teenager, he enjoyed building gasoline engines for the motorcycles that he raced. 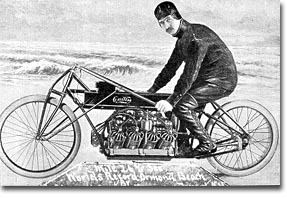 In 1907, he became known as the "Fastest Man on Earth" when he set a motorcycle speed record of 136.3 miles per hour (219.4 kilometers per hour). 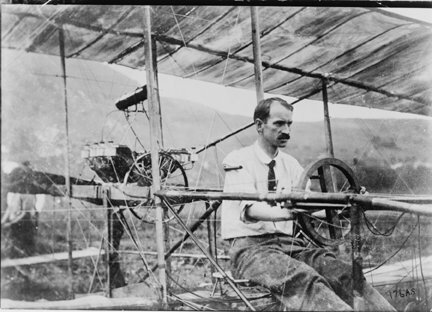 Curtiss' motorcycle engines were so light and powerful that the balloonist Thomas Baldwin, asked Curtiss to build an engine for use on Baldwin's airship. This airship became the first powered dirigible in the United States. Other balloonists soon followed Baldwin's lead and turned to Curtiss for engines for their airships. One of his engines powered the first U.S. Army aircraft—the dirigible SC-1. Curtiss and Alexander Graham Bell, the inventor of the telephone, founded the Aerial Experiment Association (AEA) in 1907, which designed and built several aircraft. One of the aircraft built by the AEA was the first American aircraft to be equipped with ailerons, the White Wing. The invention of the aileron led to a protracted patent fight between Curtiss and the Wright brothers. The AEA also built the first seaplane to be flown in the United States. 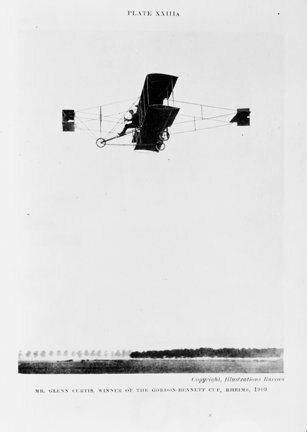 In 1908, Curtiss won the Scientific American Trophy in the first plane that he built and flew, the June Bug, when it made the first public flight of more than one kilometer (0.6 mile) in the United States. Glenn Curtiss won the Gordon-Bennett Cup at Rheims, France. In 1909, Curtiss and his Golden Flyer won the Gordon Bennett Trophy, plus a $5,000 prize, at the Rheims Air Meet in France. He had the best speed in a two-lap triangular 6.2-mile (10-kilometer) course, averaging 47 miles per hour (75.6 kilometers per hour). A Curtiss plane was used to make the first takeoff and landing on the deck of a ship in 1911. Another Curtiss plane, the NC-4, made the first transatlantic crossing in 1919. Curtiss also built the first U.S. Navy aircraft, called the Triad and trained the first two naval pilots. He received the prestigious Collier Trophy and the Aero Club Gold Medal in 1911. The Curtiss Aeroplane and Motor Company was the largest aircraft manufacturer in the world during World War I. When it went public in 1916, it was the world's largest aviation company. During World War I, it produced 10,000 aircraft, more than 100 in a single week. The Curtiss-Wright Corporation was established on July 5, 1929, with the merger of twelve Wright and Curtiss-affiliated companies. The company still exists. Curtiss made his last flight as a pilot in May 1930 when he flew a Curtiss Condor over the Albany-New York route. He died two months later.